Ladakh! 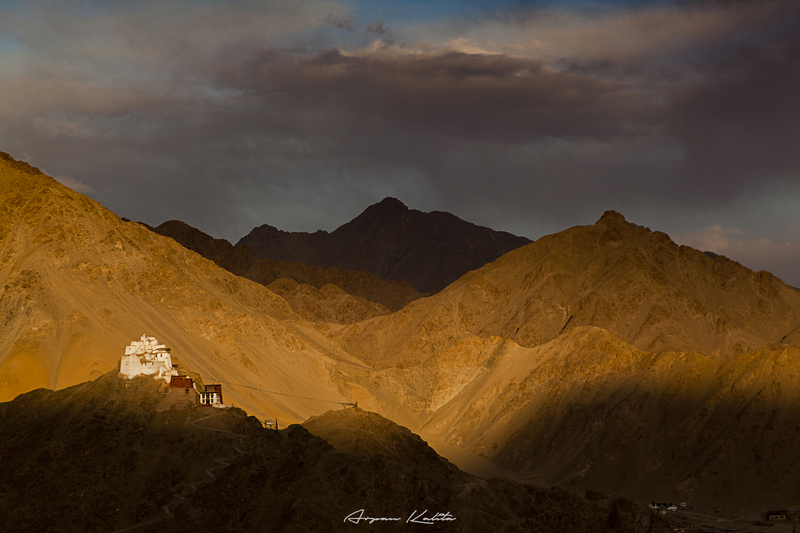 Spectacularly jagged, arid mountains envelope this magical Buddhist ex-kingdom, the Holi Roof of The World. Picture Perfect Monasteries dramatically crown rocky outcrops amid whitewashed stupas and Mani walls topped with countless mantra inscribed pebbles. Fluttering prayer flags spread the message of spiritual happiness with the mountain breeze and prayer wheels spun clockwise release more merit making mantras. Oh did I miss the Supernatural landscapes and the breathtaking lakes? Hemmed in by walls of dramatic mountains, Ladakh, is unquestionably the most traveled and photographed destination in India. Hop in for an exciting road trip, click photos that you have always dreamt of. Hop in, the unforgettable Ladakh landscape is calling you. Arrive at Leh by your morning flight from Delhi where our team will pick and transfer you to the hotel. On arrival, have some hot tea and take Rest till noon for acclimatisation. In the evening the team will proceed to Shanti Stupa for Photography session. On return the team will be briefed on the prospect of Photography during the course of the next 7 days. Meals: Breakfast. Today we will travel light to allow us more time to acclimatise. After early morning Breakfast the team will head to Sangam, the confluence of the River Indus and Zanskar with stops for Photography. After a brief Photography Session at Sangam, we will have an early lunch at Sangam and head back to Magnetic Hill to witness nature’s magic. Enroute, we will halt at Gurudwara Patthar Sahib and then will further head to Spituk near Leh for an evening Photography session. Evening can be utilised visiting Leh local market and street photography. Meals: Breakfast. After early breakfast, we will start our journey towards the beautiful Nubra Valley through the majestic Khardugla Pass. Depending on the time of arrival, we will move to the famous Hundar Sandunes for evening photography session. People who are interested can also take Camel rides there. We will spend the evening hours reviewing and discussing landscape and travel photography. Interested participants can go out in the night for a session of Night and Astro Photography post dinner. Meals: Breakfast, Dinner. Take your early morning flight to Delhi and then further to your home town with bags full of memories and wonderful photographs you have clicked during your journey. All ground transfers [Leh to Leh]. Note: You have to travel a day advance. For Example, if you choose Group 1, to reach Leh then you have to reach Delhi on 6th July 2019 because Leh departures are very early in the morning. For any guidance while booking the tickets or to book the trip please get in touch with us at +91 97060 33594 (Call/WhatsApp).